So I have been tagged in this by my wonderful friend Tori who is over at pinaforesandposies.com so thank you Tori! You should totally go over and check out her blog because she’s just a fab person! This tag is basically for new bloggers to recognise other new bloggers and talent! 1: Mention the blogger who tagged you and thank them. 4: Give them 11 questions to answer. 5: Notify your nominees on Twitter. 1. if you could choose any lush product to recommend what would it be and why do you love it? 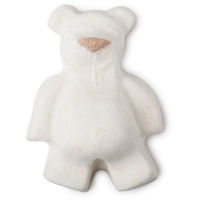 I’d always say Butter Bear/Ball (same product, different shapes!). This is simply because it is the first lush product I ever tried and it’s still one of my favourites now! It makes my skin feel AMAZING and the scent, oh my gosh! I’ve never met anyone who doesn’t like this product, so it’s a great one for recommencing first time lush buyers! 2. knowing what you know now, what advice would you give your 14 year old self? Hang in there babe, life gets a lot better and you’ll be happier and more confident one day, I promise xoxox. 3. what’s the one place you want to go to most in the world? 4. name your favourite book character and explain why you love them so much? I adore Hazel from The Fault In Our Stars because she has such a fab, witty, positive outlook on life depsite her being really ill! She’s v inspiring. 5. name your favourite make up product? I’m trying really hard to decide. 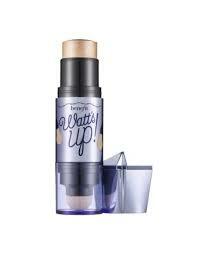 Watts Up Highlighter by Benefit. 6. a blog post your most proud of ( link me!)? I got a fab reaction to my antibullying week post and it was really tough for me to share, so probably that one! 7. name 5 people or blogs that inspire you ( because its tough to chose just one)? This sounds weird but mainly youtubers! Just because there is so much I wanna say and I don’t feel confident enough to do videos, so I thought I’d try blogging as I’m much better at writing and I fell in love! 9. If you could meet any historical figure you liked, who would it be? 10. if you could do anything you wanted in your life, what would it be? 11. do you have any body modifications, like tattoo’s or piercing’s, and what do you have? I have my ears pierced and a second hole on my left pierced. So two earrings in my left and one in my right. No tattoos as of yet but I definitely want some! What inspires your blog the most? Whether that be a colour scheme, a person etc. Do you feel your blog has helped you to grow as a person? If so, how? Do you stick to a blog schedule? Why/why not? Which form of Social Media is your favourite for blog promotion? What product, can be absolutely anything, would you recommend? Do you see blogging as a hobby or a job? Can’t wait to read them all! Would you offer guest writers to write content for you? I wouldn’t mind composing a post or elaborating on some of the subjects you write about here.